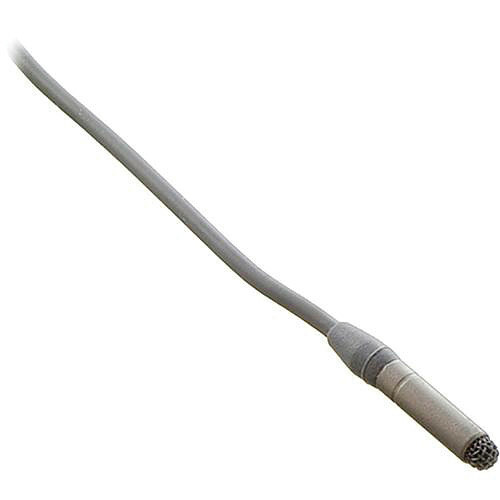 The gray COS-11D Omni Lavalier Mic, Normal Sens, with Hardwired 2.5mm Connector for Lectrosonics Wireless Transmitter by Sanken is for capturing audio. It is designed to be used for various applications such as broadcast TV, theater, film, videographers, and more. Delivering an audio performance that meets the standard of modern digital wireless microphone systems, the COS-11D addresses the noise issues associated with digital in order to ensure a pristine audio signal. Plus, the wide frequency response ensures accurate, transparent audio reproduction; and its omnidirectional polar pattern provides a generous pickup area while minimizing feedback and off-axis noise. Furthermore, an improved water-resistant mesh screen protects against humidity, perspiration, makeup, bad weather, etc. This COS-11D terminates in a 2.3mm connector and is wired for use with Lectrosonics Tip/Sleeve for MM400C and WM (watertight) transmitters. Accessories are sold separately and are not included with the microphone.